BELLIN -Karte von der Bay Chesapeack und den benachbarten Landen. . .
BELLIN, J.N. / ARKSTEE / MERKUS - Karte von der Bay Chesapeack und den benachbarten Landen. . . 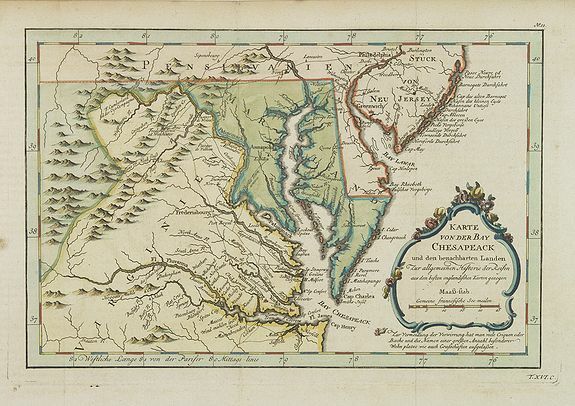 Title : Karte von der Bay Chesapeack und den benachbarten Landen. . ..
Map maker : BELLIN, J.N. / ARKSTEE / MERKUS. Size : 9.6 x 11.3 inches. / 24.4 x 28.8 cm. Description :Uncommon German text edition of Bellin's important and interesting map of the Chesapeake Bay, with excellent detail on New Jersey, Maryland, Virginia, and Pennsylvania. Indicating many cities and villages, rivers, islands, mountains, and the major travel routes between the towns. In smaller format, he issued the Petit Atlas Maritime (1764), which contained 580 charts, as well as maps to illustrate l'Abbe Prevost's "Histoire Générale des Voyages" (1746-1757). Bellin also produced a substantial number of important separately issued maps, particularly reflecting continuing discoveries and political events in the Americas. Condition : In very good condition. Text in German. Very good, dark and clear impression.